The term Postropolis is derived from the Greek root -polis meaning city-state—or independent self-governing community in which everything was decided by a social process—combined with postro-, a conflation of the roots post- (after) and metro- (measure), to form Postropolis. Postropolis is the conceptualization and planning for what comes after cities in human civilization. We are one species sharing the world with all other species. Based on this fact, let us conceptualize and build one big “after city-state” of networked nodes of dynamic human habitation distributed appropriately across the planet according to natural physical boundaries. 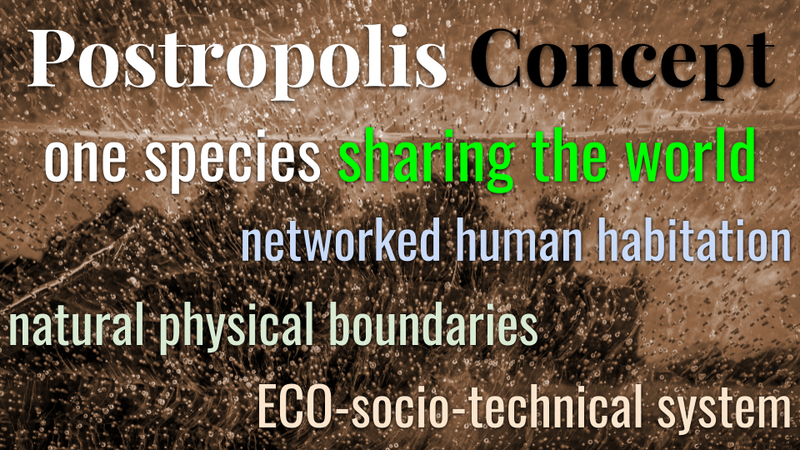 Postropolis is an eco-socio-technical system: environment subsumes people; people build and control technology in service of both. Pragmatically, Postropolis is a watershed-based network of dynamic urban core districts connected through a resilient human transportation network. 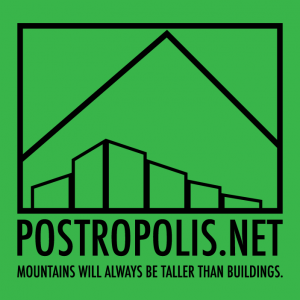 Postropolis is a platform, a learning system, and a commons, fostering systems thinking and wisdom for all people, by doing what we do: living, working, interacting with machines and natural environments. Because Postropolis is a reconceptualization of human civilization, it is human(user)-friendly and human-scaled, but never anthropocentrist. In short, Postropolis is a platform, a framework, and a process. The Postropolis platform is conceptualized as a hybrid digital immersive space for hosting the framework and the process, as well as curations of artifacts resulting from the use of the framework in any process. The Postropolis framework is conceptualized as an xAPI data model for understanding interspecific relationships. The Postropolis process is conceptualized as any number of ways to combine evaluation, problem-solving, design, development, and implementation using the Postropolis framework to build solutions for interspecific problems we identify, such as, for example, when we find out that certain arrangements of wind farms are dangerous for bird migrations. Why do we need Postropolis? As a species, we are not well. Industrial civilization and exponential human population growth continuously facilitated and amplified by the insatiability of capitalism are not sustainable. We are overshooting, if not overshot. We must drastically change our behavior, individually and collectively, institutionally. We must put ourselves on a new trajectory of global social organization. Sparta Streetscape: Sustainable Systems Strategies or Stubborn Soap Opera?